The first time we faced a Thanksgiving after going gluten and dairy free was really daunting. In addition to avoiding gluten and dairy, we also tried to avoid as much refined sugar as possible. And what is the holiday season without gluten, dairy, and sugar?!? I remember the feeling of “we won’t be able to eat anything!” so profoundly. Thankfully, we’ve gotten better and better at going into the holiday season with confidence. I’ve learned that while there are definitely some swaps to be made, we don’t ever need to miss out on the joy and tradition of holiday feasting. 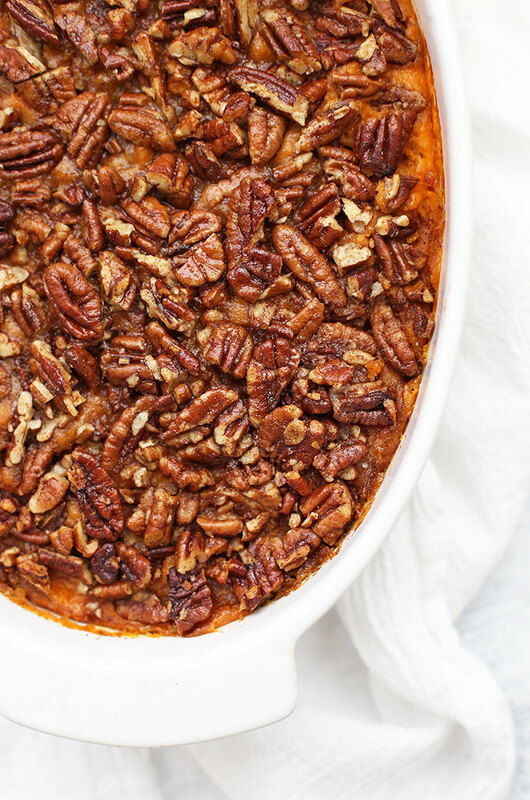 This naturally-sweetened paleo sweet potato casserole is a perfect example. It’s gluten free, grain free, dairy free, refined sugar free, and can be made either paleo (with eggs) or vegan (with an egg substitute). And if you’re thinking, “well, does it even taste good?” I invite you to make it and taste it for yourself. The filling! Velvety smooth sweet potato puree is dressed up with a little bit of milk (almond or cashew are my favorites), some pure maple syrup to enhance the sweet potatoes’ natural sweetness, a little healthy fat for a touch of decadence, and a little salt and vanilla to round things out. A Gorgeous Pecan Topping. The topping is as good as ever. Sweet candied pecans stud the surface like little cinnamon-dusted jewels and make every bite taste close-your-eyes good. Plus, since the sugar is so much lower, you’ll have plenty of room for pie later! This Recipe is Easy! 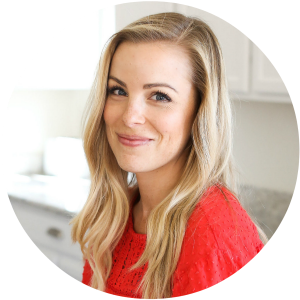 Maybe you’re a long-time gluten free, paleo, or vegan eater. Or, maybe you’re a total newbie. Maybe you don’t have any dietary restrictions, but you’re cooking for someone who does. It won’t matter–this recipe is DELICIOUS and doesn’t require any fancy flours or hard-to-find ingredients. It’s straightforward and absolutely delicious. It Works for Paleo or Vegan Diets. And It Will “Fool” Anyone. I’ve tested this with eggs and with powdered egg substitute for my egg-free and vegan friends. I love it both ways! The eggs/egg sub bind everything together and give it a little structure so it doesn’t fall apart on your plate. And EVERYONE will love it, no matter what their dietary needs are. 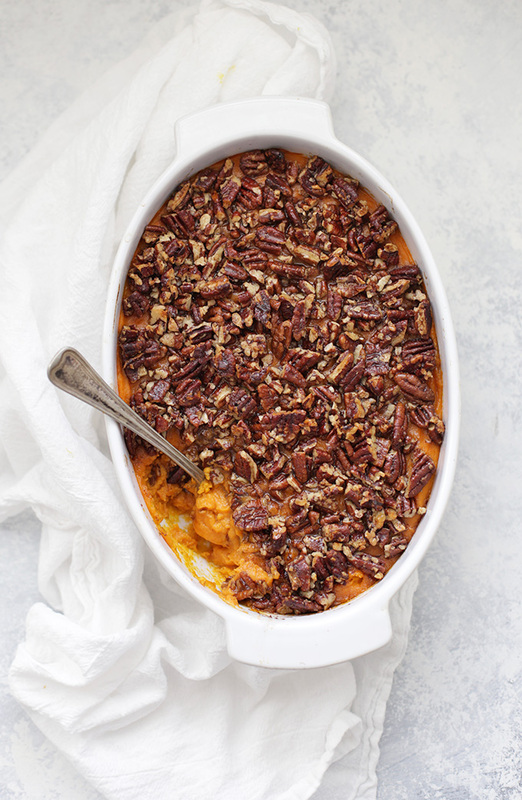 It’s always one of the fastest side dishes to go on Thanksgiving! Michael can be a tough crowd when it comes to comparing new recipes to old favorites and he LOVED this. The first bite had barely gone in his mouth before he exclaimed how good it was. I’d feel confident bringing this to a family dinner where there’d be all kinds of different diets included. It’s another recipe in my Thanksgiving arsenal I’m so glad to have sorted out. This Thanksgiving will be our best (gluten and dairy free one) yet! 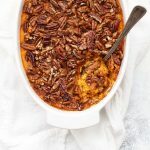 And whether you make this a paleo sweet potato casserole or a vegan sweet potato casserole, I hope it will be yours, too! Make it ahead! 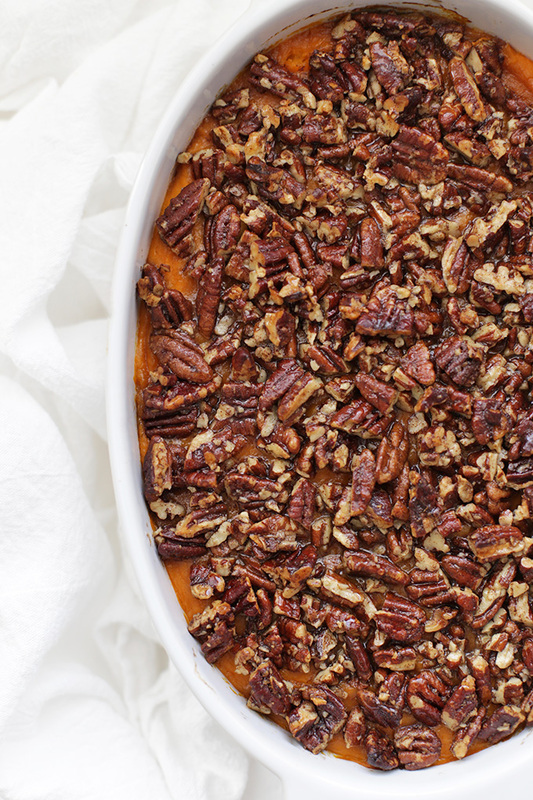 The beauty of sweet potato casserole is that you can assemble the ingredients ahead of time. This puree can be made the day before, then you can mix up the topping right before you bake it. One fewer thing to do on Thanksgiving Day! 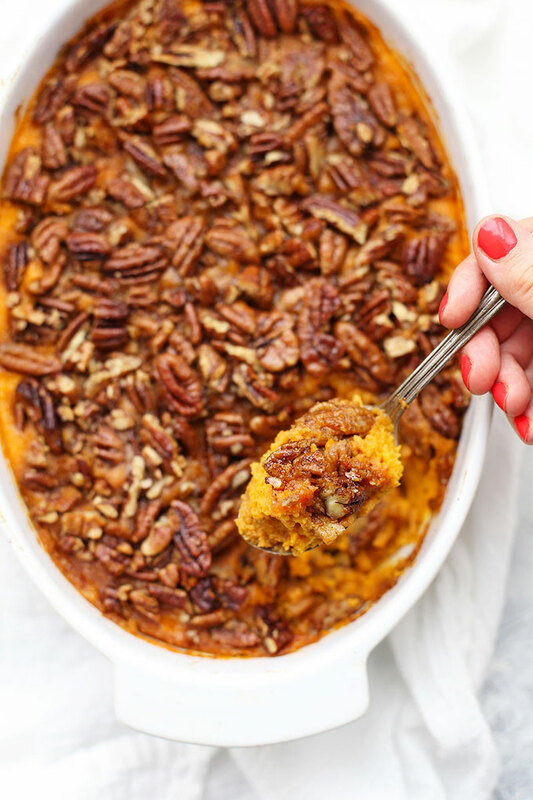 Make it a Vegan Sweet Potato Casserole (egg free) – I tried this recipe using eggs or Ener-G egg replacer. Another one that has worked well for me is The Neat Egg. I haven’t tried this yet with a flax or chia egg, so I can’t speak to how well it would turn out using those. If you’d rather omit the egg/egg sub, you won’t miss anything in flavor, but the texture will be a bit looser and more like a puree than a cohesive mash. You can use a little less milk for a thicker mash to compensate for this. If you want to skip the topping…If you’re allergic to nuts or simply don’t care for them, you can absolutely serve this as a mash on its own. You’ll want to reduce the milk to about 1/4 cup and you’ll probably want to add the cinnamon to the mash (since you won’t be adding it to the topping). Looking for a good old-fashioned sweet potato recipe? This is my all-time favorite before we switched to a GF/DF diet. The topping is mind-blowing. 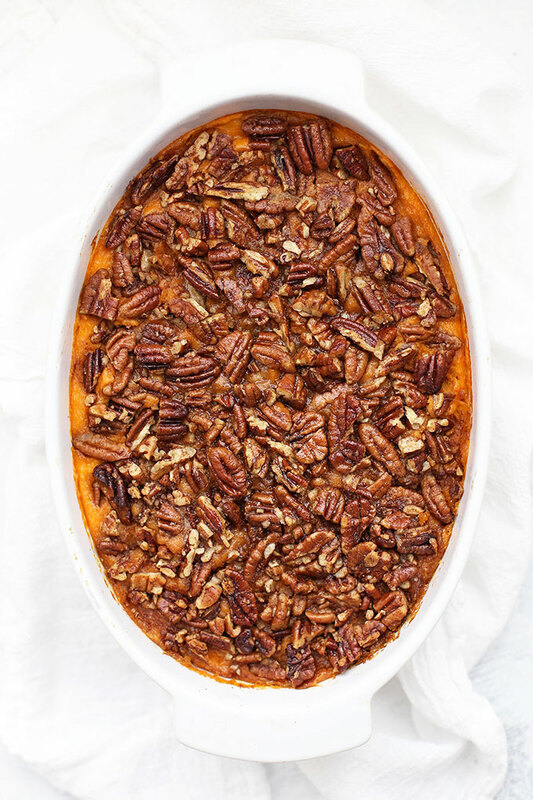 It’s super sweet (almost like a sweet potato pie), and it was always my favorite Thanksgiving indulgence. If you’re using egg replacer – follow the directions on your package. Most call for about 1 Tbsp of water per 1 Tbsp of powder. Place sweet potatoes in a large pot and cover by at least 2-3 inches of water. Bring to a boil over medium-high heat. Boil until completely tender (potatoes will pierce easily with a fork). Drain sweet potatoes. Transfer potatoes to a large mixing bowl. Add milk, butter/oil, syrup, salt, vanilla, and egg/egg sub. Mash until no lumps remain. If needed, add 2-3 Tbsp additional milk if your mixture seems too thick. 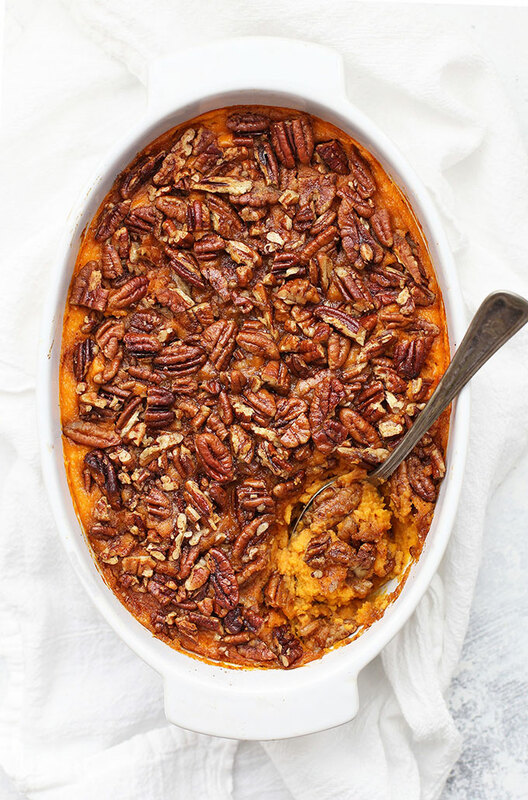 When ready to bake the sweet potatoes, preheat the oven to 375 degrees and make the topping. In a medium bowl, combine pecans, butter/oil, syrup, cinnamon, and salt. Sprinkle over the sweet potato mash. Cover the dish with foil and bake 20 minutes at 375 degrees. Remove foil and bake another 20-25 minutes. If pecans begin to brown too quickly, simply cover with foil again. **If you’ve got multiple things in the oven (like on Thanksgiving), allow yourself some extra time. If your oven is set to a lower temperature or full of other dishes, you’ll need to bake this closer to an hour. Be sure to watch your pecans (I only remove the foil when there’s about 20 minutes to go). This looks amazing! We’re hosting Thanksgiving this year, and I think this needs to make an appearance on the menu! I’m delighted you found a way to include this in your feasting. It sound super yummy!! Do you peel the potatoes first? Thanks! Actually, sweet potatoes can be boiled or steamed WITH the skins on. Just score the skins lengthwise all the way around with a sharp knife. You can cut potatoes in half so they cook a little faster too. After they are fork tender, drain them & low to cool so you can handle them. They will slip right out of the skins. No peeling, no mess, a real time saver! Great tip! Thanks for sharing Carolyn! Making this tomorrow! Thanks for clarifying on the peeling of the potatoes. I found the recipe this morning and by the time I came back you’d answered my question. Can’t wait to feast on this. I hope you love it! Happy Thanksgiving! Hi, I’m making this today. For the egg replacer–I’m using energ egg replacer. Should I follow the box instructions and use warm water or just add 2 Tbspn. of egg replacer without the water? Minna – Your choice! It will work either way, but I prefer to add the water. I’ll update my directions to say that! Good luck today! Made this for Mother’s Day…just dumped the egg replacer powder in. My wife told me I ruined it! She told me I had to follow the box directions. Please clarify your instructions to give the options…help save other marriages the turmoil of this argument!!! Just kidding (except we did debate it until I found your comment). Our casserole turned out great! Making this morning for a vegan family member. Happy Thanksgiving! Lynn – I hope everyone enjoys it! Happy Thanksgiving! Just found your blog this week. Thank you so much for this recipe! I made this for my two vegan daughters and they loved it. More important, the whole family loved it – a very delicious dish and something that will become a holiday tradition for our family. Oh, I’m so glad to hear it Patrick! Hope it was a wonderful Thanksgiving! Hi Emily! We are doing Christmas in the woods this year in our trailer and I wanted to make this a few days in advance (make on Wed and bake on Sunday). I will be using real eggs. Is it ok to assemble all but the topping and store the sweet potato casserole uncooked for a few days? Or should I fully assemble and bake completely and then reheat? I’m just not sure what is the best approach since there are raw eggs involved. But I also don’t want it to dry out. Thanks so much! This looks awesome! Celia – What an adventure! I haven’t made it that far in advance (I’ve only ever done the day ahead), but I think all your concerns are spot on! You may want to fully bake it and then heat it up the day you plan to serve it. I’d love to know how it turns out for you! Enjoy your Christmas in the woods! I made this for a Boxing Day feast and it was SO GOOD! Thanks for the great recipe. Oh, I’m so happy to hear it Christina! Hope you have a happy New Year! Made this for Easter and the whole family loved it. I used coconut oil and honey in the potatoes, and even could have cut back on the honey. I’m SO glad to hear that! It’s remarkable how sweet everything is on its own! The cinnamon and vanilla really make you feel like it’s sweeter than it is! This looks yummy! Can you add orange juice to this casserole? That sounds delicious! I haven’t tried that, but I’d LOVE to know what you think if you give it a try! How would you add orange juice? I mean, where would you add it in the recipe and would you be adding it in place of something else or in addition? Thank you Fiona! It’s one of my FAVORITE holiday dishes! I have always wanted to make this . I tasted this in our church and it was really good but he added marshmallows to it. Rachel – That would probably be too big a pan unless you doubled your recipe. I’m not sure how deep your 9.35×7 pan is, but it actually might work! You just want about 2 quart (8 cups) capacity. If you’re nervous, you can test it with that much water and see if it’ll hold! Hooray! Hope you LOVE it! Just found this recipe and we are new to Paleo. I was wondering if you could make the mash and freeze it several days ahead? Thaw, place topping and cook. Faith – I haven’t done it that way before, but it would probably work? I think I’d actually assemble the whole thing and freeze it ready to bake. Otherwise, you can absolutely prep the mash a day in advance, store it in the fridge, and keep the topping separate until you’re ready to bake. Breanne – Oh, don’t apologize! It’s a great question! You may want to add 5-8 minutes or so, but it really shouldn’t need much longer than that. Good luck and Happy Thanksgiving! This may be a silly question, but can I use and electric beater to mix, or would that make it too runny? Not silly at all! You can absolutely use an electric hand mixer! 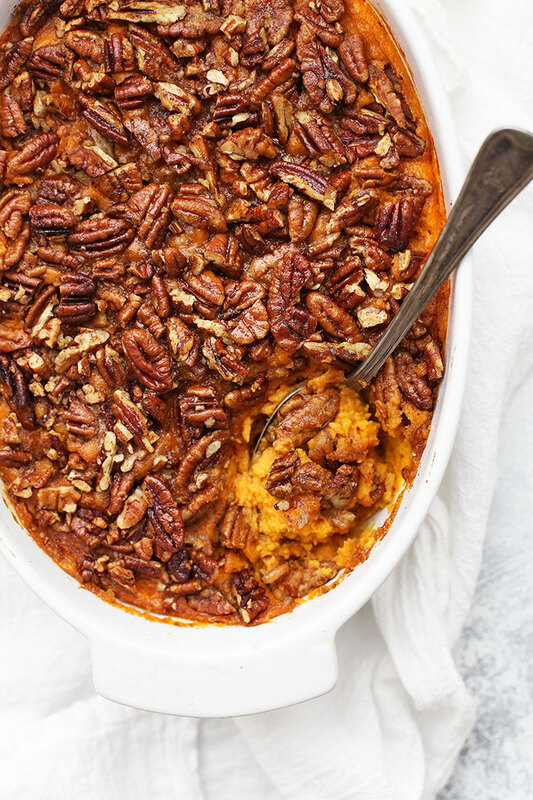 This is about the third time I have made this and I have to say this is my absolute favorite sweet potato dish I have ever made..paleo or not!!! Everyone who tries it loves it!!! Thank you so much for sharing and have a great Thanksgiving!! Melissa – Thank you, thank you, thank you for letting me know! You totally made my day! Happy Thanksgiving! New to be vegetarian and making this for my family right now! Carrie – I hope you LOVE it! It’s a HUGE hit at our house! I used 1 banana to replace for each egg and it turned out perfect!!! That’s so clever! Glad you enjoyed it! Wonderful recipe! Made this for Thanksgiving instead of the regular family recipe and everyone raved about how good it was. Only after I received multiple compliments, I revealed that is was healthy. Gasp! Even the non-paelo/vegans took seconds. This WILL be the new (holiday) staple recipe! Angelle – I’m SO happy to hear that! So glad you loved it!!! I love this recipe! I used neat egg and it was delicious. I may try it without next time, just to see :). We will definitely be making this again! Thank you! I’m so glad you enjoyed it Alicia! Sonia – I apologize for not getting back to you sooner! I’ve been with family all day. I think you can add them as usual, and then just un-cover the pan for the last 5-10 minutes or so. I think they’d be fine! Hope you LOVE it! Janice – I’m SO happy to hear that! Thank you for sharing and brightening my day! This is the only way (to date) that I have been able to get my 5-year old son to eat sweet potatoes (he even cleans his plate of them). I’ve made this dish twice now; my first preparation was made exactly as the instructions call for (this preparation I give a 4-star rating). Tonight I’ve made it again; this time I’d brushed the sweet potatoes with olive oil (after washing and drying the skin) and baked for 1 hour on 350 (the oil causes the skin to separate from the potato during baking). By this preparation, I found the mash has far less water content, and causes the pecan topping to turn out so much better (a *5-star* rating)! Wow! I’ll have to try it your way next time! I’m so happy to hear they’re a hit with your son! Emily I’m making this for a Paleo friend for Easter. Can I bake this the day before and heat it up? You can totally make it ahead. My first recommendation is to make each part (the filling + the topping) and store separately overnight, then sprinkle the topping on and baking right before serving. If you don’t have time, you can bake it the day before, then re-heat it on Easter. Hope you all love it! I made this last year for Thanksgiving. My family totally loved it. My question is will this freeze well? I need to make it in advance now. Lu – You can freeze it. I recommend freezing the filling in the pan unbaked and covering with foil, then just adding the pecan topping right before baking, if you can. If you’re going to re-heat it directly from the oven, you’ll need to put it in a cold oven (to avoid glass/ceramic bursting with the temperature change) or freeze it in a flexible aluminum baking pan to allow for temperature changes. I hope that helps! Oh, I’m SO glad! We just love it! Thanks for sharing this recipe. I’ve made it with eggs and love it, but I’m going to try it with Ener-G this year. Have you done the “night before” method with Ener-G? For some reason, I’m wary of trying that. I don’t really know why. 🙂 Thanks in advance for your feedback. Ecfinn – I haven’t actually. I’m making mine with Bob’s Red Mill this year and plan to do it the night before. That one’s made with potato starch, tapioca flour, baking soda, and psyllium husk. Ener-G is made with potato starch, tapioca flour, cream of tartar, cellulose gum & modified cellulose, so the ingredients are pretty similar. I think you shouldn’t have any trouble if you mix it well with the other liquids and into the sweet potatoes. That way, you shouldn’t get any lumps. I’d LOVE to know how it goes if you give it a try! Maris – Great question! For the most part, white and orange sweet potatoes will behave similarly. Sometimes white ones can run on the drier side, so if you find your mash doesn’t seem really smooth and wet, you may want to add a bit more milk to the mixture. I hope you LOVE this! Meredith – The oval baking dish I used is a 2-quart dish (same volume as an 8×8″). If you want a 9×13″ you’ll need to double the recipe. 🙂 The baking time should be just about the same (if not 2-3 min more). Hope that helps! Would it be possible to cook this in a slow cooker so that I can keep it warm and intact without transferring to a slow cooker to keep warm for a large gathering?…..may not have oven available to keep it warm. Denise – Hmm… I’ve never cooked it that way. I’m not sure if the pecans would crisp up? I worry they’d just steam. 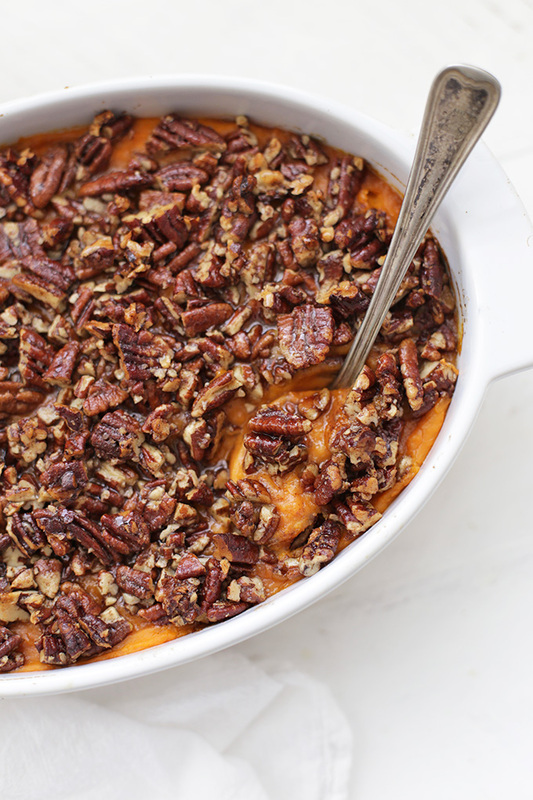 That said, I know there are some slow cooker sweet potato casserole recipes out there! You may want to give one a quick Google to see what they suggest. Hi, trying to sneak in some healthy paleo dishes to my boyfriend’s family thanksgiving. I have a ton of canned sweet potato a friend didn’t want and was wondering if I could substitute it in place of regular whole potatoes to save money. Did see this question from anyone in previous comments. Any thoughts? 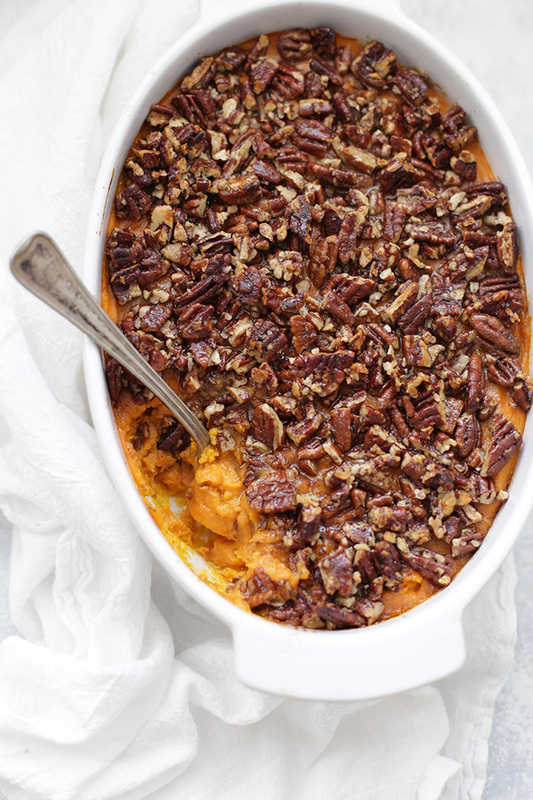 Mal – My aunt always uses canned sweet potatoes for her sweet potato casserole. I think as long as you have the right weight (and drain any liquid), you’d be fine! Hope everyone LOVES it! Sure! I don’t think you’ll need to water it down–it should be good! turned out great; thanks so much. INCREDIBLE! SO thankful for this recipe. I added a teeny bit of birch syrup I got in Alaska for a unique flavor – fun stuff 🙂 Best sweet potatoes EVER. My mom was super upset with me for not making her traditional sweet potatoes with marshmellows (something I’ve never enjoyed, even as a kid). I let her try a taste of this one and she loved it too! Thanks Emily! YAAAAAY!!! I LOVE hearing that. Thank you so much for sharing! This recipe turned out amazing!!!! Do you know what the portion size is for a serving? Everyone loved it! I added some mashed carrots, reduced syrup a bit to compensate for the sweetness of the carrots, and it was a favorite side dish at Thanksgiving. Thanks for the recipe. Definitely a new family favorite! Sheri – I bed I’d love it with the carrot addition! I’ll have to try that sometime! I do! I think it’d be great. I’d say it’d easily last 3-4 days total. Every time I make this dish it’s a huge hit! Everyone loves it even with the coconut milk. Thank you for sharing 🙂 I’ve even shared with others because they’ve been asking where I got this recipe from!